I love figs! Some of my favorite memories as a kid involve the figs my dad would put in everything. He grew them himself and managed to keep his tree alive in our southeastern Pennsylvania yard! 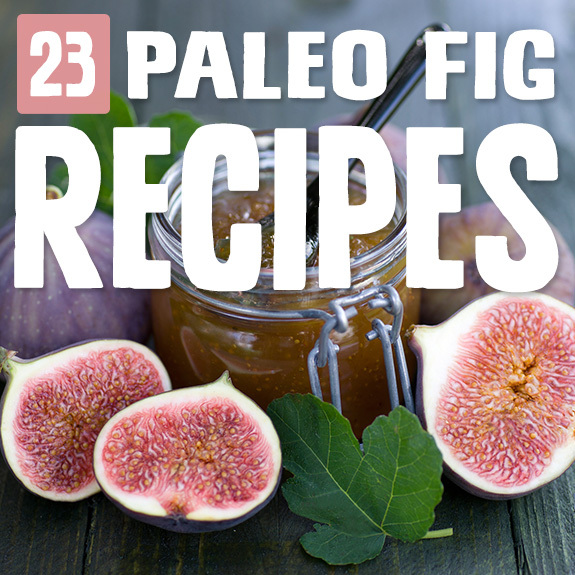 Need some fig recipes? Try these. This porridge is a perfect replacement for oatmeal first thing in the morning. Best part? It has veggies in it! Yes, this fruity and sweet bowl has zucchini, cucumber, fennel, blueberries, prunes, ground hemp seed, and more. This cake is as delicious as it is beautiful. 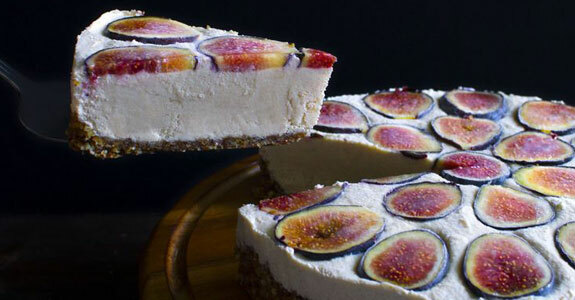 It’s made with a date and nut crust and a filling with raw cashews, coconut or almond milk, coconut oil, apple cider vinegar, lemon juice, vanilla extract, cinnamon, and fresh figs to slice and lay over the top of the cheesecake. 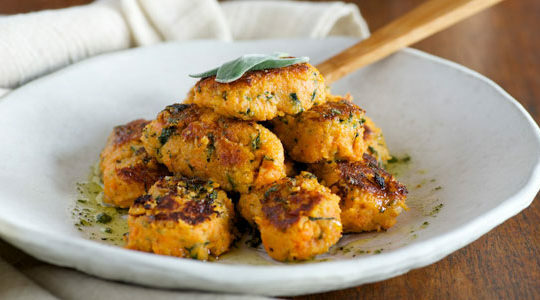 Looking for a paleo-friendly stuffing for this year’s Thanksgiving celebration? Look no further than this roasted delicate stuffing with apples and figs. Delicata is my favorite winter squash, and the apples and figs add a delightful sweetness that isn’t overwhelming. I absolutely love figs on pizza, and this recipe is perfect with a cauflower crust bound with eggs and coconut flour, hemp hearts, basil, garlic, spinach or arugula, red onion, and walnuts. The recipe calls for cheese, but you can certainly make this a cheese-free pizza. Part of what I love about salads is that you can really make them beautiful just by adjusting your ingredients, and who doesn’t love to eat something as beautiful as this salad with its lovely colors and that gorgeous golden-red dressing? It looks good enough to drink! We all have those days. So for the moments when you really need some relief, and you need it in the form of an absolutely delicious smoothie made with cherries, mangos, coconut cream, lime juice, basil, and fresh ginger, go for this recipe. Figs are super good over ice cream, and this ice cream is dairy free, which makes it the perfect way to enjoy your sweet fruits. You’ll need to switch out the sugar in this recipe for coconut sugar The toasted pecans and gooey fruit really raise the bar for this bowl of goodness. 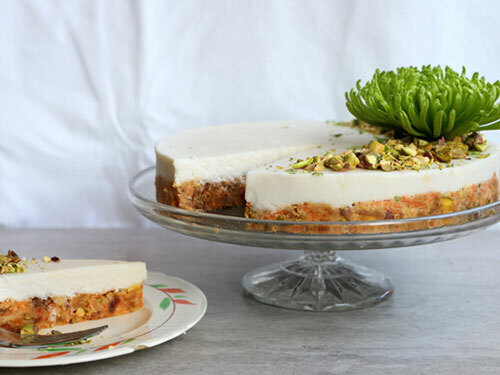 These little guys are perfect for an easy dessert, and they have two layers of amazing flavor and whole ingredients. You’ll make the base from shredded coconut, almonds, fried figs, coconut oil, sea salt, and coconut cream. 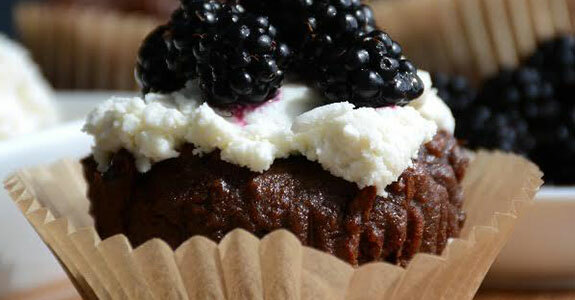 The top later is a lovely lavender flavored cashew cream with vanilla and lemon. 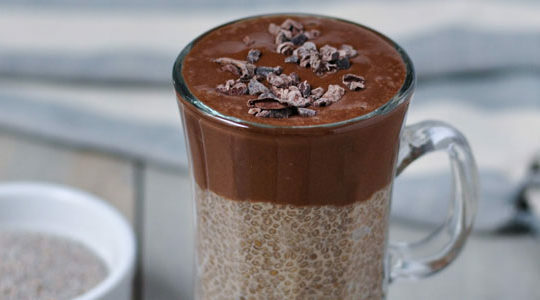 Love chia seed pudding? Want some for breakfast? Try this version made with almond milk and honey, with vanilla extract, almond extract, and a strawberry fig “jam” sweetened with just a bit of honey. 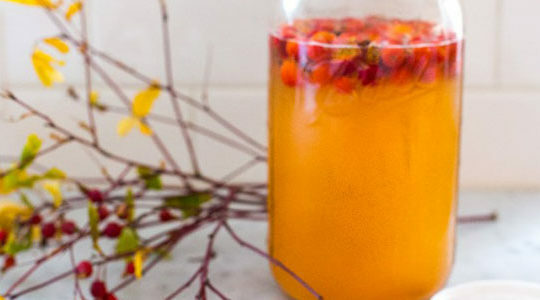 Put it in a jar and it becomes a breakfast on the go! The occasional treat doesn’t have to be off limits just because you’re trying to eat real foods. This recipe is made with walnuts, eggs, natural sweeteners, tahini, figs, coconut flour, and other real ingredients to create a muffin that’s sweet for the body and soul. Made with oranges and protein powder, this smoothie is a nutritional boost that can help you fight that cold. Add chia seeds, figs, ice, a bit of stevia if necessary, and some fresh orange zest and drink up this smoothie that tastes like the creamsicles of your childhood. 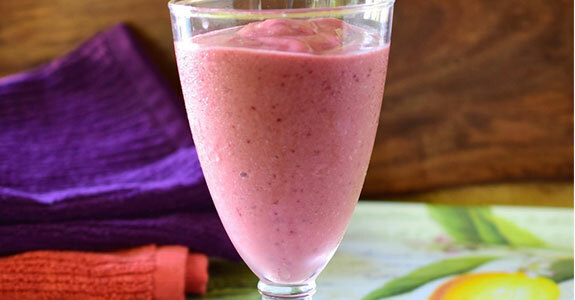 This breakfast smoothie has everything you want in the morning: something fruity, something creamy, something filling, and something just slightly sweet. It’s made with figs, yogurt (use coconut yogurt), banana, nut butter, paleo-friendly granola, vanilla, and a dash of cinnamon. 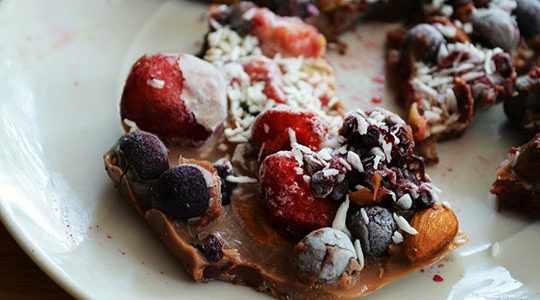 Maybe when it comes to breakfast, you’re more of a scone person. Nothing wrong with that! These scones are made with almond and coconut flours, tapioca starch, seasonings like nutmeg and cinnamon, coconut oil, coconut milk, honey, figs, vanilla and coconut butter for drizzling. 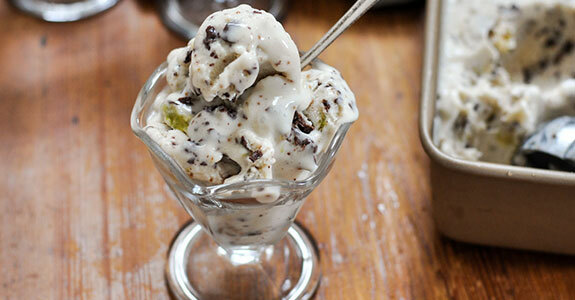 This ice cream, made with full fat coconut milk, features honey, vanilla, cinnamon, chocolate chips, and fresh or frozen figs. For the thickener, try the grass-fed gelatin option (see the post for details) instead of xanthan or guar gum. Super creamy! If figs are my favorite pizza topping, caramelized onions are my second favorite. And when you roast those figs? Man, I can’t even handle it. This recipe uses a grain-free crust, grass-fed butter, raw honey, and an optional meat topping of choice (hello prosciutto). I’ve said before that I love skewers, and this recipe is a great way to use up some figs. You’ll need honey, balsamic vinegar, olive oil, garlic, thyme, white onion, steak, red onion, and of course, a handful of figs. 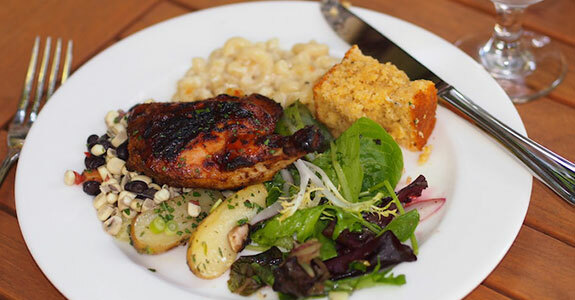 You’ll want to fire up the grill for this one! Looking for a jam recipe? Here’s your winner with the combination of raspberries and chia seeds. You’ll use green figs for this recipe, and you can get them frozen. In addition to fruity sweetness, you’re getting the vitamins, Omega 3s, and proteins from the chia seeds! 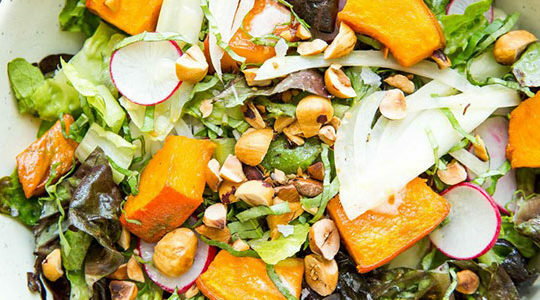 This salad is perfect for fall, or any time you’ve got some butternut and figs that need using up. 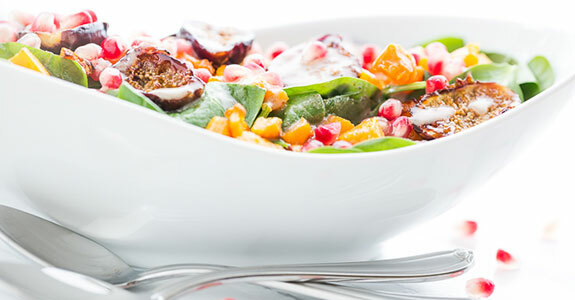 The base of the salad is spinach with pomegranate arils, and it’s topped off with a delicious pecan vinaigrette. Banana? Chocolate? Tahini? Cacao Nibs? Vanilla? Could this recipe get any better? I think not. These delicious bars are packed with healthy and nourishing ingredients and topped off with a bit of dark chocolate for good measure (and good moods). Cashew flour is great, and I’m glad cashews have been making a splash on the food scene lately. These cookies are super flavorful with fresh figs, chia seeds, cashews, coconut flour and coconut sugar, cinnamon, vanilla, and coconut oil. This full meal recipe is to die for, and it’s definitely going on my shopping list for dinner some night this week. It’s a fairly simple recipe, too, and only requires bone-in chicken, fresh figs, jalapenos, sweet potatoes, olive oil, salt, pepper, honey, and balsamic vinegar for a sweet glaze. This super easy salad is made with peaches, balsamic vinegar, honey, bacon, figs, spring greens, almonds, olive oil, grainy mustard, and apple cider vinegar. Feel free to leave out the bleu cheese—consider it optional! One of the reasons figs are so fantastic is that they can work well in both sweet and savory recipes. This crispy chicken recipes uses bone-in, skin-on chicken with ghee, black pepper, lemon, shallots, and figs to make an awesome dinner with a fruit compote cooked in the chicken drippings. Yum. Love all these recipes! Thank you for sharing my fig and orange smoothie!